It is said that reading widens your perspective. But that will not happen unless you read all views on the topic. With that in mind , I picked “Ajay”. Initially I could not understand the reason behind the book’s name . Ajay meaning one who can not be defeated , does not suit Kaurava brothers at all. Was it a word play with the “Jaya” , the other name of mahabharat ? This I would like to ask the author some day. It was not easy for me to connect to the book for the fact that I was too accustomed to treat Pandavas as good ones and the Kaurava brother duo of Duryodhan and Dushasan as being the notorious ones right from their bith. How wrong ! How can a child be this evil unless conditioned to be so ? the transition of Suyodhan and Sushasan to be known by their now popular names is both amusing and little saddening. To imagine the teachers being ignorant enough to curb a child’s curiosity in name of religion and rituals rings a bell to the current scenario where religion is used to preach a lot of senseless stuff. The portrayal of the society in that era and the troubles of the lower castes and the poor bears a parallel to today’s Indian society. no wonder , corruption , crime and rebels were so convincingly used in the plot. 100 pages into the book , I kind of appreciated the fact that the author had so carefully and so perfectly turned every character into a human being. No divine powers and miracles were left assumed to be so. Every event and character had a reason and a role to play in the epic we know as Mahabharat – from the well known to the unknown people. Everything was lot more plausible than the Mahabharat based books I have read before , which always had a mythical and mystical air about the story. I liked the dialogues of Bhishma and Balaram about bringing change in the society and to keep trying as they seemed fit , in hope it would make some effect on generations to come. Personally , the meeting between Balaram and Suyodhan was very inspiring read for me. Krishna , who is another very prominent character in this story has been painted in an entirely different light , a bit shocking at times and at others , it fits too beautifully in the plot to be even noticed until the end where I found myself asking , Was Krishna really a God or given that title by humans for their sake. Which reminded me of the part where Balaram says that everyone has god within them. I totally heart this book and wait for the other two parts ( Oh yeah , the book is huge already ! ). This has made me look at the tale with a new pair of glasses and I hope I can get to read other such works this year. I let this book sit upon my shelf for a long time before I started reading it a couple of weeks ago. It sounded like one of those riding the current mythology wave, and I hadn't heard good things about it from my other reader friends. However, the huge success of Neelakantan's debut book, Asura, and the fact that this was a story of the 'other side', piqued my interest. We've read altogether too many Kaurava-bashing Mahabharatas, and a fresh perspective was welcome. 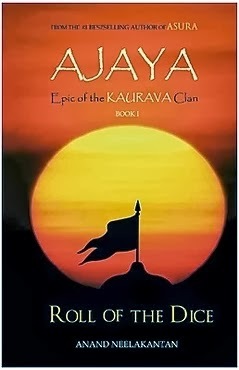 It is interesting that Neelakantan should pick a name like Ajaya for his trilogy, because to me it seems like a subtle and intentional mockery of the 'original' Mahabharata, which was called Jaya. Incidentally, popular mythology author and illustrator, Devdutt Pattanaik, has also recently wrote a book by that name, which did very well. The word 'Ajaya' means invincible, but phonetically split, A-Jaya also looks like the anti-thesis of Jaya. Neelakantan seems to have decided to be the anti-heroes' torchbearer from the word go, as he subtitles the book Epic of the Kaurava Clan. Roll of the Dice is the first of the three books in this series. Roll of the Dice takes a little time picking up pace, which might explain the few discouraged readers I spoke about earlier. He takes his time introducing the principal characters like Bhishma, Drona, Kripa, Balarama, Karna, Parshurama, Shakuni, Ekalavya and of course, Suyodhana (Duryodhana) and dedicates entire chapters to them. But once the stage is set, the plot gathers speed and the story flows easily from one chapter to the next. The author paints detailed character sketches, even those of minor characters like Jara, Dhaumya, Takshaka and Mayasura, gently convincing the readers to empathise with the traditional villains. In fact, Neelakantan's excessive sympathy for the underdog translates into large-ish portions dedicated to the untouchable beggar Jara and his blind dog, Dharma. Jara's continued presence in the plot evokes tremendous pathos and keeps reminding the reader that this is the story of the other side, which no one has ever wanted to hear. Neelakantan is convincing in his portrayal of Suyodhana (nicknamed Duryodhana by the Pandavas) as a kind-hearted if short-tempered soul. Karna, who is generally recognised as a noble character even in the 'regular' Mahabharatas, is shown as a valiant warrior and friend, and Ashwathama & Sushasana (aka Dushasana) as loyal friends and supporters. Only Shakuni is the pure villain in Neelakantan's book. The author also succeeds in painting the Pandavas, Kunti and Krishna in a rather vile light, portraying them as a ruthless and conniving bunch. Only Arjuna's character is shown to have some nobility. He downplays their divinity and offers rational, believable explanations instead. One of my favourites is how he explains Karna's divine Kavach (armour). He says the armour, crafted by the finest workmen, was a gift to Karna by a king belonging to a dynasty of sun worshippers. Sounds so much more plausible than a baby being born with armour, doesn't it? Even though Neelakantan rationalises a lot of mystical elements in his book, his story remains true to the original. Although sources have not been quoted, the basic plot is the same as the Mahabharata we have all grown up listening to. It seems thoroughly researched and generally legit. Some relationships/connections such as Subhadra and Suyodhana's, Karna and Parshurma's, Takshaka and Ekalavya's may be romaticised and fictionalised, but they serve the author's purpose well in painting these anti-heroes in a humane light. He is, in fact, so skilled as an author, that in just one book, I've found my faith in Krishna a little shaken. If that's not his success as an author, I don't know what else is. I shall definitely complete the trilogy as they release, and you should too.